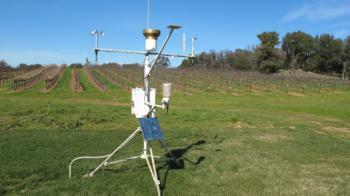 Having access to reliable weather data is an important part of farming. Weather affects irrigation scheduling, spraying for disease and insect pests, cultural practices and growth of crops. CIMIS (California Irrigation Management Information System) stations are operated by the California State Department of Water Resources. Not every county has a CIMIS station (Calaveras and Tuolumne do not) and the stations require maintenance of grass required to calculate baseline evapotranspiration (ET0). CIMIS data is available via quick link to monthly totals on the right. The UCIPM weather page has CIMIS and other weather station data that is publicly accessible and does not require a password. 8 steps to weather online for directions on how to access weather data on UCIPM.